In the previous tutorial, we have learned how a JSP Page translated into a servlet code. 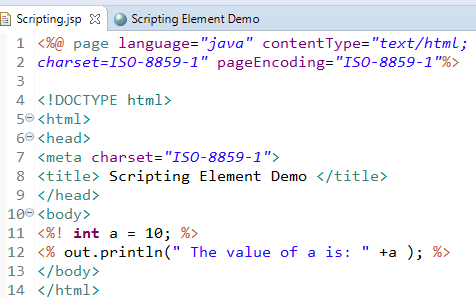 In this tutorial, we will learn about JSP Scripting Elements with Example. 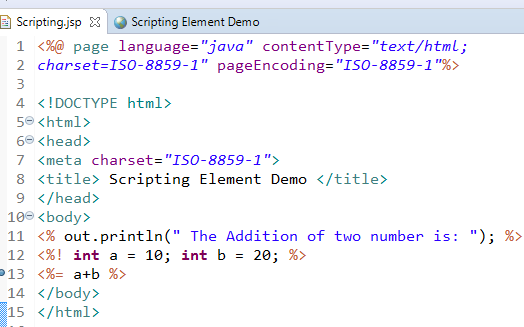 Basically, there are 3 types of Scripting Elements in JSP, JSP Declaration, JSP Scriplet, and JSP Expression tag. We will learn these tags in detail. 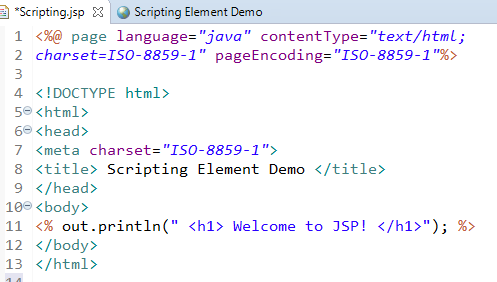 But first, understand what is JSP Scripting Elements? Declaration tag in JSP Page is used to declare variable and methods. To define variables and methods of instance scope, it is used. Variable defined in declarations may be accessed from multiple threads, so they must be thread-safe. When JSP Page is initialized, then declaration is initialized and are made available to other declarations, scriptlets, and expressions. 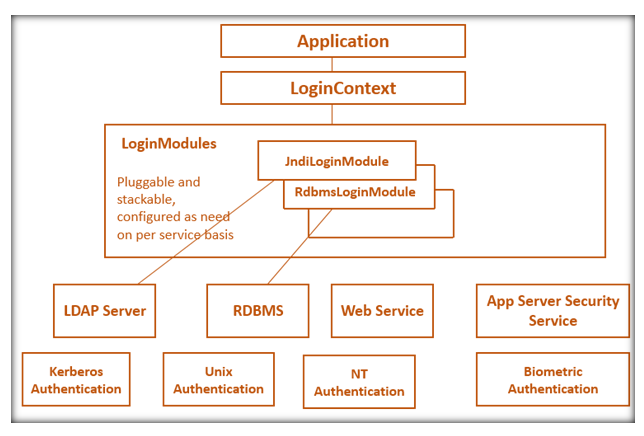 Scriptlet tag is used to write java code into JSP Page. It is typical that scriptlets are intermingled with template text. Since each section has to be contained between the <% scriptlet code %> syntax, therefore this causes a JSP page to be quite difficult to read. Because the variable and the code are local to the _jspService() method, therefore scriptlets don't have the same thread safety issue as declarations. JSP Expression tag is used to print the value of variable and methods. At request processing time, the expression is evaluated, and then the result is converted into a String. If the result of the expression is an object, the toString() method is called. A ClassCastException will be raised if the value can't be coerced into a String at translation time. If you don't know about Exceptions, we will be recommended you to first learn the basics of Exception in Java.